Heavy duty. Not easy to install, however, even with a template. Revive old cabinets in the kitchen or bath with these sleek circular knobs. 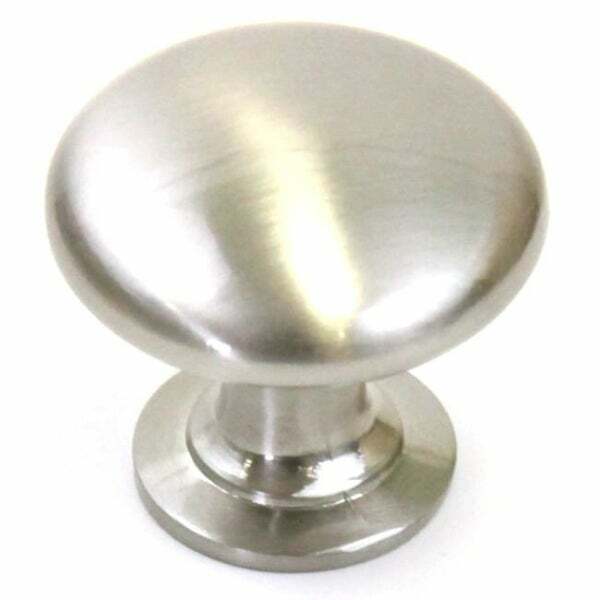 Designed to replace your existing hardware, these knobs have a smooth stainless steel finish that resists wear and tear to stay looking great for long-term use. The knobs are packaged with the mounting screws required for easy installation. Dimensions 1.25 In. X 1.25 In. X 1.0 In. My kitchen was in need of a face-lift. I decided to add knobs to the cabinets. The "stainless steel brushed nickel finish" knobs were a perfect selection. My guests ask, what did you change in your kitchen? I am so pleased with the new look. I replaced brass knobs on my vanity with these. They updated it with a new look which I now love. There were a few that had some imperfections on them, but for the most part they were great. Great Value for the money. These are nice, solid knobs. The base is slightly smaller than the ones I was replacing, but you don't really notice once they are all on. KNobs were as expected. Look good in the kitchen. The knobs are much smaller than I expected. The screws are not long enouh to penetrate through my drawes and into the knobs. I've tried to find alternate screws but cannot match the size and length needed. Will have to return them. They look as advertised and they some weight to them as well. This is the style that we decided on and was an excellent price. Tips on Choosing New Cabinet Pulls from Overstock.com. Here are some tips to help you choose cabinet pulls that will enhance your kitchen cabinets.